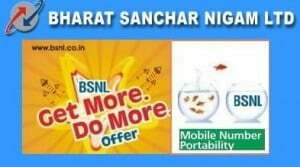 India’s National Telecom back bone and pan India 3G mobile service operator Bharat Sanchar Nigam Ltd (BSNL) all set to launch Nation Wide Mobile Number Portability by 20 January. The PSU today unveils its Pan-India MNP offer, which will give Free Connection, Free Mobile Internet and lots more for all Port-in customers who Switch to BSNL from any other service providers across all the telecom circles except Haryana. The much awaited Mobile Number Portability (MNP) service schedule to launch by 20 January on Pan-India basis as earlier we hare on TelecomTalk. According to the BSNL offer the MNP Port-in charges of Rs.19 shall be waived off and Free SIM card (32K) will be provided for all “Port In” subscribers who Switch to BSNL. Apart from the Free In-Porting, For prepaid subscribers, The STV/First Recharge Coupon (FRC) chosen by the customer to use the BSNL Mobile Services shall be FREE of cost if Port-in is through BSNL CSC. At the time of activation of all Port-in customers, will also get Additional FREE Talk Time of Rs. 100 in addition to the normal FREE talk value applicable with FRC. All Port-in customers will be offered GPRS Data Access up to 5 GB for one month free of charge. While for Postpaid Subscribers, The Activation Charges will be waived off and 50% rebate in the Fixed Monthly Rental/Charges (FMC) will be offered of first month after port in to BSNL. The Freebies for Call/SMS/Data will be will remain same as Tariff Plan selected by Port In subscriber. BSNL has the largest 3G coverage in India covering about 700 cities and also has widest 2G coverage in every nook and corner of the country. It is hoped that customers shall avail the attractive value proposition of BSNL 3G data and GPRS Plans. The customers having a landline telephone shall benefit from the popular “Pyari Jodi” scheme of BSNL where calls from the Mobile to BSNL landline are free in the service area. All the Customers porting into BSNL network shall have the option of availing all 3G facilities. The fixed monthly charges for 3G post paid customers are same as that of 2G customers. Thus it is a great opportunity for the customers to move to BSNL with 2G number and avail the BSNL 3G network. 1. Port-in customer will take UPC by sending SMS PORT followed by 10 Digit Mobile Number to 1900. 2. Port-in customer will submit CAF (application form) and MNP form with UPC at CSC. 3. Customer should be asked for an alternative number and desired FRC (2G/3G etc.) and record on BSNL/Porting CAF for future use. 4. Customer will be given a virgin SIM. On this virgin SIM, his number will be created afterwards. It is to be informed to the customer that after 72-96 hours or on getting SMS he/she may insert the SIM in the mobile and dial ‘123’ to activate BSNL services. 5. CCN person will complete the required entries in Fx GUI, mention type of FRC in the prescribed field and fire order for creation of new port-in number using MSISDN, IMSI, UPC etc. 6. SIM will be created after minimum 72 hours (assuming it is approved by the port-out operator) and maximum 96 hours. 8. Before activation of the BSNL services, there will be an interruption/ transit time of around 2 hours i.e. subscriber will not be getting services of any operator. What about incoming roaming charges when we are in roaming..